The Godfather is a three-part American movie series that has secured over $578 million in Box Office revenues. The movie series has gone down in history as one of the most revered pieces of cinematic brilliance, and have won several Oscars across categories including Best Picture. Besides being immensely entertaining, the series also offers some incredible insights into people and their behaviors. Let’s look at five invaluable leadership lessons from the man who played one of the most iconic characters in cinema. The Godfather was known to use his ears more than his mouth. This is what differentiates a good leader from a great one. When being in a position where you lead a company, it pays to keep your eyes and ears open and hear what people have to say. This helps you take more informed decisions since you get to decide after looking at things from other people’s perspectives. Besides, when you listen, your team feels they can trust you, and they come to you with information that you could use to your business’s advantage. Marlon Brando (The Godfather) knew that a current loss or leeway might win him a bigger favor in the future. He knew when to pull the strings for a greater good. In business, it is important to understand that every move will not lead to a win, but plan your moves such that they add up to a great success, in the end. The saying – Rome was not built in a day, stands true even today. Don Corleone understood that each coin has two sides. He not only planned his actions, but he also predicted their reactions. This helped him prepare for the worst. As a leader, you too should be prepared for the worst, since you have the responsibility of an entire team and the welfare of the office at stake. Develop your strategies with not just the plan of action but also the possible results. This will give you a better perspective and eliminate risks. Throughout the movies, the Godfather assigns tasks to who he feels is best suited for the job. Key points to note are – firstly, to take your own decisions and secondly, delegate the activity to be executed by the person best suited to carry it out. It is likely that you feel that no one can carry out tasks as well as you can, but as a leader, you need to use your resources and train them. The series portrays a classic example of how to do so with not just ease, but also with efficiency. Sonny Corleone, his son, can vouch for this. What people fail to realize is that in business there are winners and losers, and family, cannot take precedence. 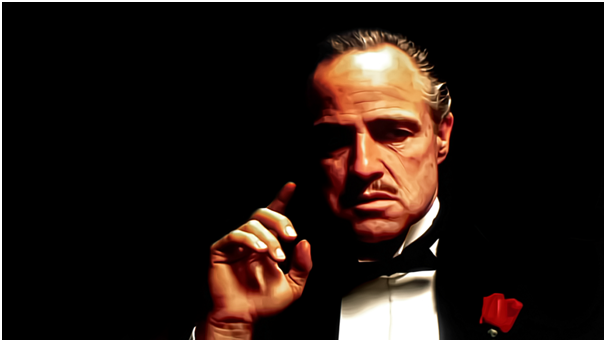 In fact, the very meaning of the word Godfather shows that a blood tie is not a prerequisite to a business equation. Being ruthless and often detached while taking business decisions is a necessary skill. Hone it and you shall be able to outgrow and outsell your competitors.